As I compose this, there are less than 12 hours to the trade deadline. There has been an expectation for days that the Twins would do something to at least shore up their bedraggled bullpen, if not shortstop or catcher. What I said here Thursday stands on Friday: I don't want a short-term deal with prime prospects. The 2015 Twins have a chance to make the playoffs, but the real window of opportunity is down the road still. Certainly one has to give something to get something, but the price still needs to be right. The vast majority of pre-deadline trades don't swing the pennant race or postseason. Carl Pavano and Orlando Cabrera in 2009 were August acquisitions that worked out pretty well. The Matt Capps trade the following year was more about the postseason than the division race, and the Twins never got him a lead in the playoffs. A Thursday rumor connected the Twins to Justin Upton (San Diego outfielder). I don't see the fit. Another rumor had the Cubs pushing hard to move shortstop Starlin Castro, just 25 but hitting .237 with a poison pill contract. As troublesome as shortstop has been for Minnesota, I'd rather go with the current grab-bag. And neither Upton nor Castro would address the biggest problem on this roster: A low-octane bullpen. That's not, in truth, a problem that needs a big name player to resolve. A minor deal -- the right minor deal -- will do the trick. We're all waiting on that one. The Twins are not exactly playing inspired baseball these days -- the clown-show sixth inning Wednesday, with its "wild pitch" through Kurt Suzuki's legs and the three-run Little League homer, being a particularly atrocious example -- but they are still, barely, in a playoff spot at the moment. If the Twins make no trade this week and ultimately miss out on a wild-card berth, I'm good with that. If they trade Max Kepler or Jorge Polanco for a bullpen rental, I'll have to see a World Series trip to be satisfied with the move, and that sort of outcome is not guaranteed. The Twins are nine games behind Kansas City in the division. They're not catching the Royals. That means their door into the postseason is a wild card berth, That's a one-game crapshoot. Unlike Kansas City and Detroit, their realistic time is down the road a bit. This is prime time in the Royals' cycle. They need to make their push now, because key parts of their lineup are in late arbitration years or approaching free agency. The Royals management recognizes this; that's why they traded much of their farm system for two to three months of Johnny Cueto and Ben Zobrist, and it's why they're treating Salvador Perez as a disposable asset. Flags fly forever, and the Royals don't care if Perez is a wreck in five years; he won't be there by then anyway. The window is closing in Detroit, regardless of whether they trade free-agents-to-be David Price and Yoenis Cepedes. Their farm system has been neglected, the core of the roster is aging and the financial commitments to Miguel Cabrera and Justin Verlander in what figures to be their decline phases are staggering. The Twins, on the other hand, are a team in transition with better days ahead. I genuinely don't want them making short-term moves except in the bullpen, and I certainly don't want them trading away prime prospects for rentals. Trading a good prospect for a multi-year fix at shortstop or catcher, yes, but that's more likely a wintertime move than a deadline deal. The next question is whether Arcia can demand anything in return. The market for platoon designated hitters (Arcia's optimal role) has always been limited, and this isn't Earl Weaver's American League. Walker might be another matter; if he gets his strikeouts under control he might be the next Nelson Cruz. But that's a big if. Trevor Plouffe went on paternity leave after Tuesday's game; the baby, to be born today, will be the first for the infielder and and his wife Olivia. Jorge Polanco gets the brief callup. Today was the first game since hurting his ankle that Sano didn't wrap it. Ran the bases better today, took infield before the game. If Miguel Sano's ankle is good to go, this presents an opportunity to give the rookie some time at third base. That would be ideal from a development standpoint. But the Twins very much need his bat in the lineup -- Mike Melancon, a quality closer, pitched around Sano in the ninth last night, which underlined how quickly Sano has gotten the reputation of being difficult to pitch to -- and they have other options for third base if the ankle is at risk. As for Polanco: My normal take on this kind of thing is, if's he's gonna be in the majors, play him. The Twins now have four supposed shortstops on the roster (Eduardo Escobar, Eduardo Nunez, Polanco and Danny Santana) and nobody they really feel comfortable with at the spot. Tuesday was Escobar's first start at shortstop in more than a week and only his second since July 3; he had a big double in the eighth-inning rally and made some good plays in the field. I would be fine with giving him sustained playing time there, even if that means Polanco sits during this callup. Glen Perkins has had four appearances since the All-Star break. He has given up at least a run in three of those outings with two losses and two blown saves. He says he's fine, and we should take his word for that, but it's also worth remembering that he said the same thing late last year before finally admitting that there was a problem and the Twins shut him down for the final weeks. A good bit of player movement going on as nonwaiver deadline approaches. Troy Tulowitzki, who is as good a shortstop as there is when healthy (which hasn't been often in the past five years), was apparently traded late Monday by Colorado to Toronto for fellow oft-injured shortstop Jose Reyes. Also involved in the trade: old friend LaTroy Hawkins, three Toronto pitching prospects and some $50 million in salary relief for the Rockies. There's been speculation for years about the Rockies moving Tulowitzki and his big contract ($20 million a year through 2019, 14 million in 2020 and a $15 million option in 2021), and now it has happened. Reyes, who actually is paid more this year than Tulo, is probably going to get flipped by the Rockies in the next few days. The Rox wanted the pitchers more than Reyes, but there was no way the Jays wanted to have both shortstops on their roster. There's been an undercurrent of speculation in Twinsdom about Tulo as a solution to the shortstop problem. I never took that too seriously; five years, perhaps more, is a long timeline for a 30-year-old shortstop, particularly one with Tulowitzki's injury history. The Twins are, of course, notoriously patient with young players, and even if they weary of waiting for Danny Santana to put it together they have invested pretty seriously in some young shortstop prospects in the past two years (Nick Gordon and Wander Javier). If they trade for a shortstop, it will be for a shorter-term fix. Reyes is more likely, but not much. He's due $22 million each of the next two seasons, plus a $4 million buyout on a $22 million option for 2018. The Twins would be wiser to go for a two-month (or hopefully three) rental than a multi-year commitment. I wrote this print column in May on the book "Big Data Baseball," which described how the Pittsburgh Pirates committed to sabermetrics. On Monday, the Pioneer Press printed this Mike Berardino piece on the Twins and their own use of advanced statistics and analytics. I cannot recommend this highly enough. The Twins enter today 7.5 games behind Kansas City in the AL Central. That's not an impossibly steep hill, but it's not an easy one either. It got a bit steeper on Sunday. The Royals shored up their troublesome rotation by trading for Johnny Cueto, a free agent to be who last year led the National League in innings and strikeouts and this season sports a 2.62 ERA. It wasn't cheap. K.C. gave up three young lefties: Brandon Finnegan, John Lamb and Cody Reed. Finnegan is the one you're most likely to have heard of; a first-round pick in June 2014, he pitched out of the bullpen for the Royals in September and October during their run to the World Series. He's split this season between Double A, Triple A and the majors and between starting in the minors and relieving in the bigs. The Reds will focus Finnegan on starting, which is probably the best thing for his career. An interesting thing happened in Saturday's Twins loss to the Yankees that got lost in the furor and angst over Alex Rodriguez's three homers and Glen Perkins' blown save. Trevor May was handed the eighth inning with a one-run lead, and he held that lead. The Twins have shuffled eighth-inning duties all season. Casey Fien, Blaine Boyer, Aaron Thompson, Brian Duensing. All have been found wanting. Now, it appears, it's May's turn to try it. I still expect the Twins to do something, either before the nonwaiver trade deadline or in early August through waivers, to shore up the bullpen. But May may be the fallback option. The Twins this weekend added Michael Bowden to their Rochester pitching staff. The 2005 first-rounder has 103 games on his major league resume, mostly with Boston and none of them since 2012, but he's been having a fine season for Baltimore's Triple A team. He exercised his "out" clause when it became apparent that the Orioles weren't going to bring him up and signed with the Twins. For now he joins Jose Berrios, Tyler Duffey, Taylor Rodgers and Pat Dean in the Rochester rotation, but he has another out clause he can exercise in about a month. He's more likely a bullpen candidate for the major league club than a starting candidate, in my estimation, and there's a decent chance the Twins never bring him up at all. It's a good enough photo by itself with the shadow play behind Rajai Davis, but I picked this one in part to serve as a platform to comment on the Detroit Tigers. With the nonwaiver trade deadline fast approaching, it's possible that we're seeing the end of an era in Detroit. The minuses are piling up for the Tigers: They're basically playing .500 ball or a bit less than that. Miguel Cabrera is injured. Justin Verlander has made just seven starts, and the Tigers haven't won any of them. The bullpen is (again) a problem. The rotation other than free-agent-to-be David Price is a mess.The farm system is widely considered to be barren. And, looking to the future, the day of reckoning for some long and sizable contracts is coming. All that has created a sense that the Tigers will be peddling Price and Yoenis Cepedes, also due for free agency this month. Remember: Mike Ilitch is 86 and wants a World Series title before he dies. This is not an owner with a timeline for rebuilding. The Tigers aren't THAT far out of a playoff spot, and I rather suspect that the fact that one of the teams they need to catch to get into the October tournament is the Twins is something of an encouragement for them. They are, I think, more likely to keep Price and Cepedes, hope they can snag one of the wildcard berths and strive to do with that opening what the Kansas City Royals did last season. Then they'll make qualifying offers to Price and Cepedes and at least collect the draft picks should they sign elsewhere. The future is now for the Tigers, even if now isn't as promising as they expected coming into the season. starters. Now he works out of the bullpen. On Friday I cited the strikeout rates of the most-used Twins relief pitchers. There is, of course, another arm in the bullpen worth mentioning in that connection: Trevor May. May has, for the season, a K/9 rate of 7.7. It was 8.0 as a starter, easily the best among the seven Twins with more than one start. It's only 5.1 in his five relief outings. Normally, pitchers have more velocity pitching relief, and normally they get more strikeouts. Normal hasn't set in for May as a relief pitcher yet, and I suppose he'd rather it never does. I thought, and still do, that he should have remained in the rotation when Ervin Santana was activated, but the decision makers had a different idea. It may be that that idea was: Let's see if May can be the strikeout arm we need in the pen right now. There is a logic to that notion. He's more likely, certainly, to get strikeouts in any role than is Mike Pelfrey. But in the longer term, May belongs in the rotation. And in the longer term, one expects that some of those minor league high-velocity arms will emerge for a bullpen badly in need of some guys with swing-and-miss stuff. Perkins is barely above league average and even his K rate has been in decline over the years. Nobody else is within one strikeout of the average. Mike Berardino tweeted Thursday that the Twins were cool on the notion of trading for Miami's Steve Cishek, citing his declining strikeout rate. This, he added in another tweet, is an indication that the front office is taking K/9 seriously. I had expected that by this time some of the collegiate relievers the Twins have been drafting of late in their emphasis on power arms would be ready to emerge. But they have largely been injured or ineffective. Nick Burdi, the 2014 second rounder who wowed me last season when I saw him pitch for Cedar Rapids, opened the year at Double A and stunk (5.93 ERA with 22 walks in 30.1 innings). He was moved down to High A and has pitched well there (no walks in 13 innings), and I expect he'll be moved back up to Chattanooga soon, but he shouldn't be viewed as a 2015 answer. J.T. Chargois, a 2012 second rounder who was seen at the time as a possible quick riser, was derailed by injury, He has a 4.93 ERA at Chattanooga with 16 walks in 13 innings but has better numbers at Fort Myers. Again, not a 2015 answer. Jake Reed, a 2014 draftee who opened eyes by allowing just two earned runs at three levels last year (Appy League, Midwest League, Arizona Fall League), has spent the whole season at Double A and has compiled a 5.71 ERA. Zach Jones has a 6.00 ERA at Double A. Lefty Mason Melotakis had Tommy John surgery, Luke Bard is finally pitching at Cedar Rapids after multiple surgeries. We saw Alex Meyer's frightening two-game audition. OK, that all looks grim. Here's an interesting one: Tyler Duffey. Duffey is another member of the 2012 draft (which brought in Byron Buxton, Jose Berrios, Bard, Melotakis and Chargois as well.) He shared the closer duties at Rice with Chargois, but the Twins made him a starter and he took well to the role. Now 24, Duffey has a 2.29 ERA at Triple A Rochester. Given the current depth in starters on the roster and the rising Berrios, I don't see him getting a rotation shot anytime soon, But given his college background in the bullpen, he might be next to get a call to shore up a bullpen that can use a power arm. For the second year in a row, the Twins on Wednesday were awarded an extra draft pick between the second and third rounds. A followup on Wednesday's post and Jonathan Papelbon: The Phillies closer apparently has partial trade protection. There are 17 clubs on his no-trade list. I don't know if the Twins are among them. It's presumed that he'll insist that his 2016 option -- $13 million -- be vested before approving a trade to a team on his list. So the complicating factors in such a deal are, from this distance, less certain than I thought a day ago. We arrive in this series, finally, to the area of the Twins roster most in need of an upgrade -- and probably the one easiest to upgrade without long-term damage to the organization: The bullpen. Specifically, the bullpen in front of Glen Perkins. There's nothing wrong with Perkins. There's a lot wrong with the six others. The Twins are slightly better than AL average in terms of relief pitching ERA. No team in the league has blown fewer leads. But the average relief pitcher in the American league strikes out 8.3 men per nine innings. Perkins is a bit over that average. Other than Ryan O'Rourke, who has faced all of 11 hitters since his callup (entering Tuesday's game) and starter-in-waiting Trevor May, nobody in the current bullpen is within 1 K/9 of the league average. Good bullpens have power arms. The Twins don't have that. And that is the single biggest difference between the Twins and the Kansas City Royals. The Royals can stack swing-and-miss pitchers from the sixth inning on; the Twins have none until the ninth. I have a specific idea to address that. His name is Jonathan Papelbon. 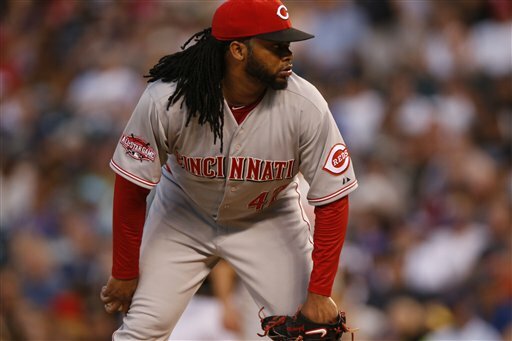 The All-Star closer is vocally unhappy in Philadelphia, and has been demanding a trade to a contender for weeks. His too-large contract expires at the end of the season unless he finishes 23 more games (more on that later), so given the frequent professions of payroll leeway, I think the Twins can absorb his deal for the remainder of the year. The Phillies are officially, if belatedly, in rebuild mode. In my mind, the only question here is if Papelbon is willing to step down from his accustomed ninth-inning role to set up Perkins. I don't know what, if any, no-trade protection he has. Taking the eighth-inning role could be expensive for him; in that role, there's no way he's finishing enough games to vest his $13 million option of 2016 (he needs 55 this year and entered Tuesday with 32). And while he remains a quality relief pitcher, few if any teams today would give any reliever $13 million a year. He says he's unhappy in Philly because they're not in contention. But losing out on that 2016 option (which he might not attain even if he remains a closer) might also make him unhappy. That aside, Papelbon figures to be a rent-a-player. A good rent-a-player in exactly the role the Twins need to upgrade. I've no idea what the Phillies are demanding for Papelbon. but I would be in favor of giving them their choice of Oswaldo Arcia or Adam Brett Walker, two young outfielders with big power and other holes in their games. In return, the Twins take all the Papelbon contract risk. The Phillies may be waiting for more than that. But it might be a doable deal in the next few days. Several big-name starting pitchers are rumored to be trade bait this month: Cole Hamels of the Phillies, Johnny Cueto of the Reds, James Shields of the Padres, maybe even David Price of the Tigers. I don't expect the Twins to be in the market for any of them, or for a lesser name either. The Twins have six starters for five rotation slots already, even with Ricky Nolasco probably out of the rest of the season after his invasive ankle surgery. It's more likely that the Twins would trade one of their starters, but even that seems doubtful at this point. The veterans should be of interest only to contenders, and I doubt that any of them would bring back a solution to the shortstop problem. Trevor May should interest a building team, but I certainly wouldn't move him for a shortstop rental. Somebody over the weekend asked on Twitter: Which starter would you want starting a Game 163 -- or, alternately, the wild card game? Obviously, the first goal would be to get there, and the Twins may not have the luxury of being selective about that starter, but we're being theoretical here. This is another way of asking: Who's the top starter in this rotation? Start with this: Ervin Santana is out. His steroid suspension kicks in after Game 162. He's not eligible for postseason or any playoff games to get into the postseason. Kyle Gibson is probably my choice. Not only does he have the best actual results of the remaining starters (2.85 ERA), his strikeout rate has risen dramatically as the season has progressed -- 8.2 strikeouts per game in June, 8.6 in three July starts to date. The discrepancy between his ERA and his underlying statistics has diminished. Behind him, frankly, I still prefer May, but he's in the bullpen and will be barring trade or injury. Sunday's awful outing notwithstanding, I probably have more confidence in Tommy Milone right now than in Phil Hughes, but they're pretty even in my view. at least until Hughes fixes whatever it is that ails his fastball velocity. It's safe to say that Mike Pelfrey is at the bottom of my preferences for a win-or-go-home start. But I'd certainly take that scenario over not making it to a win-or-go-home start. I had intended to continue the "contemplating" series today with an examination of the starting rotation, but after watching too much of Sunday's fiasco I can't bring myself to do it. So I'll chase this minor tangent instead. Bob Melvin won his 368th game with the A's, tying him for 3rd on team's all-time list with Ken Macha. Art Howe - 600, Tony La Russa - 798.. They're obviously just talking the Oakland era for the Athletics -- which is now a fairly lengthy one, since the A's have been there since 1968. Because the A's were also the team, in an era so long ago even I hadn't been born yet, of one Connie Mack. Mack managed the A's for 50 seasons, 1901 through 1950, winning 3,582 regular season games, copping nine pennants and five World Series titles. Connie Mack in his day was a legend, and to leave him off the franchise managerial list because the franchise was on the other side of the continent in his day is, again, to deny history. Res Sox baserunner Alejandro De Aza. The keystone ballet. This is from a stolen base, not the usual double play, but the principle is pretty much the same: Second basemen have to be adept at getting clear of base runners. Plays like this -- or with more collision than this -- are a on reason why young second basemen have a relatively high rate of failure to develop as hitters. Another might be that second base is where shortstops lacking a slight amount of athleticism wind up. Certainly Brian Dozier developed quite nicely as a hitter after moving to second base. So did Craig Biggio, who is to be inducted into the Hall of Fame next weekend in Cooperstown. 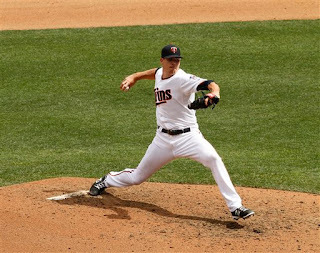 Friday was the deadline to sign 2015 draft picks, and the Twins missed on a prominent one, right-handed pitcher Kyle Cody of the University of Kentucky. The Twins gave up their second round pick when they signed Ervin Santana as a free agent, and part of why they were willing to do that was the "competitive balance" pick they were awarded at the end of the second round in the annual lottery among smaller-market franchises. That pick, No. 73 overall, was the one they expended on Cody. Cody's collegiate numbers aren't overwhelming, but he is said to be a power arm, and the Twins have in recent years been collecting (a) big fast balls and (b) pitchers from Kentucky. He had been seen entering the season as a possible first-round pick, and he was probably displeased by the lower bonus attached to a supplemental second round pick. So he's gambling that he can have a strong enough senior season to overcome the usual lack of leverage. That this one slipped away doesn't overly dismay me. The Twins compared him to Mike Pelfrey upon drafting him, and that comp doesn't make me say wow. The Twins will get the 74th pick next June in compensation for losing this one, and I suspect next June's draft will be deeper than this one. most-used DH, had 34 in 29 games. I find this odd: The Twins have added a position player (and subtracted a pitcher) to the roster at the same time that manager Paul Molitor appears to have settled on a basic eight-man lineup. Molitor spent much of May and June shuffling his outfielders, designated hitter and shortstop. Torii Hunter played most games, but sat some (no surprise at his age) and DH'ed at least once a week. Right now, Molitor's default lineup appears to be: Kurt Suzuki catching; Joe Mauer, Brian Dozier, Trevor Plouffe and Danny Santana in the infield; Eddie Rosario, Aaron Hicks and Hunter in the outfield; and Sano at DH. Which would seem to point to less playing time and fewer at-bats for Escobar, Nunez and Shane Robinson. (The second catcher, currently Eric Fryer, hasn't been part of the lineup shuffle.) Meanwhile, the beleaguered bullpen bridge between the starters and closer Glen Perkins is down an arm from its accustomed numbers. Theoretically, I prefer fewer pitchers and more position players on the roster. But if Molitor doesn't have a use for everybody on the bench and has an overworked bullpen, the roster is out of balance. I suspect that it won't be long before the Twins return to a 13-man pitching staff. The question for me is, which bench guy goes to make room? field and 11 at designated hitter. 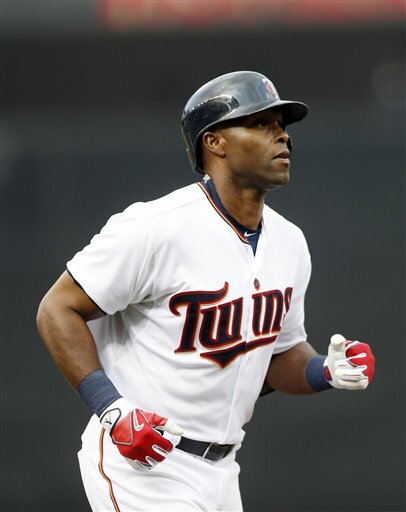 Torii Hunter's return to Minnesota has gone better than I expected, which could merely mean that the 39-year-old (he turns 40 Friday) isn't actively hurting the club. It's been better than that. His overall hitting numbers make him the third most productive bat among the regulars, behind Brian Dozier and Trevor Plouffe. He entered the break with 14 homers, second on the club -- this after hitting 17 in each of the past two seasons and 16 the year before that. His batting average is markedly lower, however, so his on-base and slugging percentages are essentially in line with last season. Merely maintaining production at his age is remarkable, but Hunter has for years defied the decline that typically accompanies aging. His defense is another matter. The eight-time Gold Glove winner still looks good in the outfield, but the metrics continue to say that he doesn't get to a lot of balls in right field. Baseball Reference's version of wins above replacement (bWAR) says he's a replacement-level player overall. It's theoretically possible that the Twins could improve on Hunter as a right fielder. But we know they aren't going to remake the roster that drastically. The stat sheet doesn't quantify clubhouse chemistry. Hunter is very much at the center of this team, and any attempts to upgrade the roster will not involve the players at the center of the roster. The realistic question is: Will the Twins bring him back for his age-40 season in 2016? Imagine for a moment that something took Hunter off the roster now. The most likely response by the Twins would be to recall Oswaldo Arcia and reinstall him in an outfield corner, with Eddie Rosario filling the other. With the passage of time, the now-sidelined Byron Buxton and Max Kepler would figure to be factors as well. If the Twins bring Hunter back for 2016, he would block at least one young outfielder. Which, if that is their intent, makes it easier to trade one (or more) away this summer. When the "Franchise Four" fan vote was announced this spring, I figured the results would suffer from what I call "ESPN Syndrome" -- the belief, fostered by the Worldwide Leader, that nothing in sports history counts unless it's on video. And so it basically proved. The Giants list, for example, was entirely players from the San Francisco era, ignoring the likes of Christy Mathewson and Mel Ott in favor of Buster Posey, a fine player but necessarily lacking the long-term stature of Master Melvin and Big Six. Neither the Athletics nor the White Sox claimed Eddie Collins, but the Sox list included Harold Baines and Paul Konerko. I've grown to expect such historical ignorance, but I decline to accept it. The eight-man Twins ballot featured seven players from the Minnesota years. Only Walter Johnson from the long-ago Washington Senators era was on the ballot. Fellow Hall of Famers Goose Goslin, Joe Cronin and Sam Rice were excluded. And when the results were announced, the winning four were Harmon Killebrew, Kirby Puckett, Rod Carew and Tony Oliva. Nothing against Oliva, but Johnson was by any measure the greater player, with a good case as the greatest pitcher ever. Of course, the Twins have spent decades pretending that the Washington era never happened. When they talk about the team's career leaders, they talk about the Twins career leaders. But Johnson deserves to be attached to somebody's history. Four hundred seventeen career wins. One hundred ten shutouts. A career ERA of 2.17 (in 5,917 innings). Twelve times the league leader in strikeouts. On and on. He didn't pitch in Minnesota, but the Twins should still embrace him as part of their history. Center field has been another kaleidoscope position for the Twins this season. Aaron Hicks has started 38 games. Jordan Schafer (released) started 20, Shane Robinson 14, Byron Buxton 11 before his injury. Eddie Rosario and Danny Santana drew a sliver of starts as well (three apiece). When Buxton arrived about a month ago, I figured Hicks had gotten his last shot at the job. But three things happened: One, Buxton did not immediately shine. Two, Buxton sprained his thumb. Three, Hicks has been a sharply better player since stepping back into the lineup. It's not just a small sample size, but a tiny one: 10 games, July 3 through July 12. Ten games in which Hicks has put up a slash line of .323/.436/.645. And it's not that he's been abnormally lucky: his batting average on balls in play is a normal .296 in that stretch. We know he's not that good -- nobody is -- but I'll guarantee he hasn't had a comparable 10-game stretch in his career. His two homers this month came right-handed, no real surprise, but he's also crushed a pair of doubles left-handed that could have gone out of some more friendly yards than Target Field. He's drawn seven walks and fanned only three times in those 10 games. Power and a batting eye. He sure hasn't demonstrated those skills in the majors before. He just looks like a different hitter, one who has a clue from at-bat to at-bat. Hicks' slash line for the season, .266/.333/.387, is not eye-popping, but it's close to league average, and that's sufficient for a good-glove center fielder. He's pushed his way out of the very bottom of the lineup, hitting seventh most games, and right now there's a good case for him to move ahead of Rosario as well. It may be another month before Buxton is a factor again, and Hicks may well revert to the weak hitter he's been until July. (He was hitting .247/.293/.301 coming into the month.) But if Hicks settles into a .270/.340/.400 groove (slightly better than his slash line to date), the Twins may well opt to give Buxton some Triple A time when his thumb is healed. This doesn't change the long-term status of the two. Buxton is still the center fielder of the future. Hicks, however, now has his best claim ever as the center fielder of the present -- and in a pennant chase, that matters. out of it at Kansas City. About a month ago, in discussing the Twins outfield, I noted that Baseball Reference listed Eduardo Escobar as the Twins primary left fielder and declared: "If he's still so listed after the All-Star break, (Paul) Molitor is doing it wrong." Well, we're at the All-Star break, and Eddie Rosario is now listed as the primary left fielder. Primary, not regular. Molitor has divvied up playing time in left field to a high degree. Rosario has just three more starts and less than 40 innings more than Escobar. Five players have gotten starts in left, and four of them have more than a dozen (the other two being Shane Robinson and Oswaldo Arcia). Arcia, of course, opened the season as the regular left fielder. He got hurt and then was optioned out to Triple A Rochester, where he has been on a home-run binge for about a week and a half. Still, he doesn't appear to be on the verge of recall. His flaws -- bad to horrid outfield defense, problems with left-handed pitching -- remain. I think he's more likely to be traded this month than returned to Minnesota. Which is, in the abstract, fine by me. (What the return is in such a trade is, of course, the key to whether trading him is a good idea.) I have been claiming for months that outfield defense is a key aspect to the Twins' surprising rise in the standings, and playing both Arcia and Torii Hunter in the outfield corners is detrimental to the outfield defense. Rosario is a much better fielder than either. But the superior defense comes at a price. While Rosario's batting average (.279) looks good, he has taken just eight walks, so his on-base percentage is barely above .300. He doesn't have Arcia's power either, and his OPS+ -- On base Plus Slugging in the context of league and home field -- is a mere 93, 7 percent below average. And while Molitor may talk up Rosario to the broadcasters as a hitter against left-handers, the early returns on him don't back it up (.239/.294/.304 in his first 52 plate appearances versus southpaws). This summer's theme of the tension between contention and transition is well illustrated by Rosario's playing time. Keeping Rosario in the lineup is obviously good for his development. But it also probably means having a below-average bat at a position usually counted on for hitting. Rosario has spent a good deal of time hitting fifth, which is not ideal for him or the team. home run home Friday night at Target Field. Just another week in the life for Brian Dozier, right? On Monday Dozier learned that he had not been selected as a reserve for the All-Star team but would be on the ballot for the "final vote" clickbait voting. That evening, he hit a walk-off homer to beat the Baltimore Orioles. On Wednesday he popped another go-ahead home run. It was less dramatic because it didn't come in the ninth inning, but it sure did matter in the win. On Friday he learned that he had missed the roster by that method also. That evening, he capped a remarkable ninth-inning rally -- down 6-1 going into the ninth inning -- with another walk-off homer. And then on Saturday he was named to the All-Star team as an injury replacement for Jose Bautista. That was an imminently predictable outcome. I never shared the general displeasure among Twins fans about Dozier's All-Star "snub". There are a number of deserving second basemen in the American League, and neither Jose Altuve nor Jason Kipnis are embarrassments on the roster. Too many players are on the All-Star rosters anyway. His absence from the roster wouldn't have detracted from what he's accomplished. Danny Santana turns a double play in Kansas City. the American League leaders at turning two. Here be uncertainty and doubt. Molitor and his bosses seem determined to find a regular shortstop in Santana, and Santana's not really cooperating with the effort. His slash line (.213/.235/.287 entering Friday's game) was second-worst in the AL among players with at least 100 plate appearances, and his 13 errors are the third most in the league at the position. Molitor seems more interested in using Escobar as a multi-position semi-regular, the sort of superutility guy that Ron Gardenhire talked a lot about but never really embraced in practice. As I've said before, that kind of player has to have a decent bat. While Escobar isn't hitting as well this season as last, he does have a better slugging percentage than six of the Twins' nine "regulars" as listed by Baseball Reference. Nunez has hit impressively this year -- Molitor has picked his spots well, with a focus on pitting Nunez against pitchers with velocity -- but his defensive reputation is exceedingly poor. I can't see him getting everyday duty, particularly at a defense-first position. As for Polanco: The prospect has moved up to Triple A, and was charged with six errors in his first six games at that level. I think second base is his destination; even if he does have a major league future at short, that does nothing for the Twins present. Polanco's presence in Rochester may signal a determination to keep Santana in the majors. Putting both of them at Triple A would mean playing one of them at second base, and the Twins probably want to see both of them playing shortstop, partly for developmental reasons and partly because they aren't in need of a second baseman. For me, one of the more intriguing aspects of the rise of Miguel Sano is how unthreatened Trevor Plouffe appears to be. During spring training, Plouffe tweeted enthusiastically about Sano's power. The day Sano reported to the big league club, Plouffe was seen working with Sano on the youngster's defense. I attended Wednesday's game; Plouffe and Sano were catch partners before the game, and when the game ended, they did their own version, just the two of them, of the outfielders' celebratory chest bump. It's an interesting dynamic. 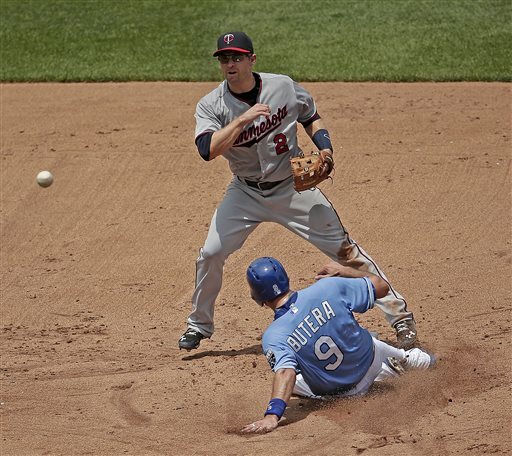 Plouffe has become a better-than-average third baseman, both in the field and at the plate. Sano hasn't played anything but third since his first year in the very lowest levels of the organization. Two third basemen, one of whom is a cornerstone of the lineup and the other a cornerstone of the future. The assumption here has been: When Sano arrives, Plouffe is no longer the third baseman. That's not the case. Not now, certainly, and maybe not for some time. In this season of contention and transition, the Twins are likely to continue to deploy Sano mainly as a designated hitter, and to keep Plouffe at third base and in the middle of the lineup. Plouffe is on a one-year deal but under team control through 2017. I doubt the Twins want to keep Sano at DH that long. Maybe Sano changes positions. Maybe Plouffe does (a few years ago he was supposed to become an outfielder, but then Danny Valencia's tenure with the Twins short-circuited and Plouffe inherited the third base job). Or maybe Plouffe gets traded. This is not a situation that needs to be resolved immediately. But I suspect something will give this winter. his home run off Baltimore's Bud Norris. 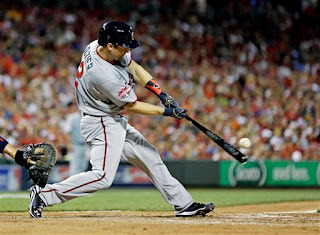 Since then Mauer has hit .351 with four homers, including one Wednesday afternoon. His slash line for the season is still unimpressive for a first baseman, but it's no longer the worst season of his illustrious career. I am occasionally asked about moving Mauer to another position or about pulling him from a regular role altogether. I don't see the first happening at all, and the latter won't come this year, or probably next either. Mauer is 32. He was never gifted with great speed, catching tends to make its practitioners heavy-legged, and everybody gets slower with age. Mauer's at an age when good hitters tend to get slid to less demanding defensive positions and bad hitters fade out of the league. First base is the least demanding defensive position. He's not going to shift to a tougher one. Granted, as a first baseman, he's got to hit better than he has in the year-and-a-half since he took that role. But the Twins will keep him in the lineup, and high in the lineup, until it's clear that they have better options. They are a long way from deciding that. Mauer has three years left on his contract after this season. It's quite possible that by the 2018 season, his age-35 year, he won't be the regular first baseman. He might be a full-time DH by then; he might be a part-time player. But Mauer and the Twins aren't to that point yet. On Monday, evaluating the Twins catching situation, I surmised here that the Twins would stick with Chris Herrmann as the No. 2 catcher behind Kurt Suzuki. Tuesday night they optioned Herrmann to Triple A, put Ricky Nolasco on the 60-day disabled list, and pulled Eric Fryer off the U.S. roster for the Pan Am games. Fryer hit .299 for Rochester this year, albeit with little power (one homer and just seven extra base hits in 184 at-bats). He's regarded as a better defensive receiver than Herrmann, but I think Herrmann, despite his poor major league numbers to date, is a better hitter. Plus Herrmann's left-handedness provided a platoon option, even though Paul Molitor didn't always take advantage of it. Fryer wasn't on the 40-man roster, but putting Nolasco on the 60-day DL opened a spot for him. Nolasco is to have surgery on his ailing ankle. I don't know how likely he is to return this year. If he does, it probably won't be until September, and the opportunities for him to get tune-up starts in the minors will be limited. Another guy went on the 60-day DL Tuesday: Former Twin Justin Morneau, out since May 16 with yet another concussion. The Rockies say the move doesn't indicate any deterioration in his condition, and he's about a week away from being eligible to come off the 60-day DL anyway. But reading between the lines, it doesn't appear that the 2006 AL MVP and last year's NL batting champ is going to be able to take the field any time soon. To repeat what I've said before about Morneau and his brain injuries: It's his life and his health, but it's probably in his best interest to retire. Reserve outfielder Shane Robinson was absent a few days on family emergency leave, his second such absence of the season. I don't think I've described his situation before, but this Derek Wetmore piece from last month does a pretty good job of explaining why Robinson comes and goes. Robinson's brief departure opened the door for Aaron Hicks to return from his rehab assignment. 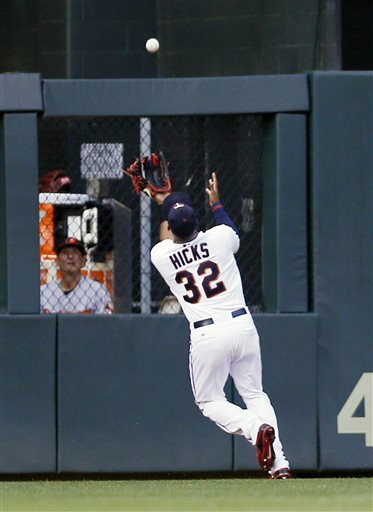 Hicks not only made a spectacular catch Monday night, he homered in consecutive games (both from the right side). Power is something that's been missing from his game the past year-plus. Robinson's return coincided with Ryan Pressly's trip to the disabled list. The right-handed reliever felt something give in the back of his shoulder Saturday. He has had a quietly good stat line (2.93 ERA with the bullpen's second-highest strikeout rate) despite occasional control hiccups. The upshot: The Twins have replaced Pressly, the bullpen's No. 3 righty, with Hicks. The other shuffled was LOOGY for LOOGY: Aaron Thompson down, Ryan O'Roarke up. I vaguely remember seeing O'Roarke in Beloit in 2012, and I mentioned him in passing in the blog, but I can't recall any specifics. He was one of seven lefties on the Snappers roster when I saw them (that was their final season affiliated with the Twins), and he didn't hold any special interest for me. The idea that he'd be in the big league bullpen before fellow southpaw Corey Williams, a recent third-round pick, would have been ludicrous. But here he is, and Williams is in the process of recovering from Tommy John surgery. There's not a lot in O'Roarke's minor-league numbers to excite you. He's been used in an emphatic one-out role for the past year and a half in Double A and Triple A. This season, for example: 22 appearances but just 15 innings, with an ERA of 5.40. He's had excellent strikeout rates in that role, but he pretty clearly has some trouble with right-handed hitters. Which is what did in Thompson, that and, arguably, overuse in the first two months. He leaves leading the American League in appearances but with an ERA of 5.01, this despite still having an impressive slash line against left-handed hitters (.189/.262/.264). The underlying point to Thompson's struggles: Even a left-handed specialist winds up facing more right-handed hitters than left-handed ones, and they have to have something to combat them with. That will be the challenge for O'Roarke. It does seem noteworthy, however, that he got the call instead of Caleb Theilbar, who spent much of the previous two seasons sharing LOOGY duties with Brian Duensing. Drew Butera, a former teammate. I'll skip ahead in this midseason review to second base, since Brian Dozier is on the fringe of the All-Star roster -- one of the "final five" in the fan voting as announced Monday. Dozier is having a fine season, to be sure. He leads the majors in runs scored, he's already approaching a career high in doubles, game-winning homer Monday night in extra innings, yada yada yada. I have no problem with the fans voting Houston's Jose Altuve in as the starter -- he hit .341 last season, led the league in batting average, hits and steals, and is the lead figure on the team with the best record in the American League. And as good a season as Dozier is having, Jason Kipnis of Cleveland is having a better one. Dozier is unique in the Twins lineup in this respect: Of all the returning position players, he's the only one hitting better this year than last. Batting average up slightly, slugging percentage up sharply -- almost a hundred points higher than in 2013 or 2014 -- but with a lower walk rate, his on base percentage thus far has receded slightly in the first half. He's 28 now, and signed through 2018. The Twins clearly regard him as a cornerstone piece. Which, I think, turns Jorge Polanco into a trade chip. Polanco, just elevated to Triple A, has been playing mostly shortstop the past couple of seasons, but my sense remains that he's a future second baseman -- a good second baseman. That's something to watch this month as the Twins look to shore up their obvious flaws. They shouldn't give Polanco away by any means, but if Dozier's the second baseman, Polanco is more valuable traded. 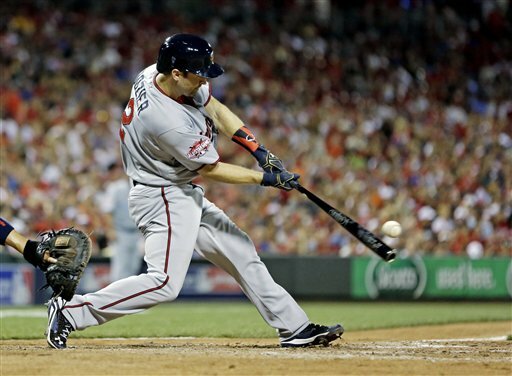 The Twins played the first half of the season with just two catchers, regular Kurt Suzuki and backup Chris Herrmann. They haven't hit at all -- Suzuki's OPS+ is 65, which means he's 35 percent below league average, and Herrmann's OPS+ is 43, or 57 percent below average. Still, there seems little indication that anything is going to change in this arrangement. Josmil Pinto, the only other catcher currently on the 40 man roster, was sidelined weeks ago by a concussion and is just starting to resume baseball activities, specifically catching in the bullpen. And Eric Fryer, who had callups in both 2013 and 2014, is going to play for Team USA in the Pan Am Games, which begin next weekend in Canada and runs through July 19. Presumably the organization would not have given Fryer permission to leave the Rochester club for that purpose if they were thinking about bringing him back to replace Herrmann on the roster. My guess is that if something were to happen during Fryer's absence that required a catcher callup and Pinto isn't ready that they'd turn to Stuart Turner, the No. 1 catcher for the Double A Chattanooga Lookouts. He can't hit either (.189 in Double A), but he wouldn't be an embarrassment behind the dish. Suzuki, obviously, gets the bulk of the playing time. He's fourth in the American League in innings caught. less than two innings behind Russell Martin of Toronto but trailing Salvador Perez of Kansas City and Mike Zunino of Seattle by wider margins. Herrmann plays only when Suzuki gets a day off. Herrmann caught the Saturday night game against a right-handed starter and Suzuki caught the Sunday day game against a lefty. That took advantage of one of Herrmann's defining traits: He hits left handed. Given his decent minor league numbers, I think he could be a reasonably productive hitter if he got more frequent playing time against right-handers, but about a third of his plate appearances have come against lefties. Such is the lot of the backup catcher. Herrman has had more success throwing out basestealers than Suzuki has. Herrmann's caught stealing rate, 33 percent, is pretty much a match for the league average, while Suzuki's is just 21 percent. There have been 21 wild pitches with Suzuki behind the plate and two passed balls charged to him. Herrmann has not been charged with a passed ball and been unable to block nine wild pitches. Suzuki has 0.36 WP+BP per nine innings, Herrmann 0.49. That's a wider difference than I would have guessed. This photo was actually made a week ago, and its only baseball connection is the setting, but I couldn't resist it. 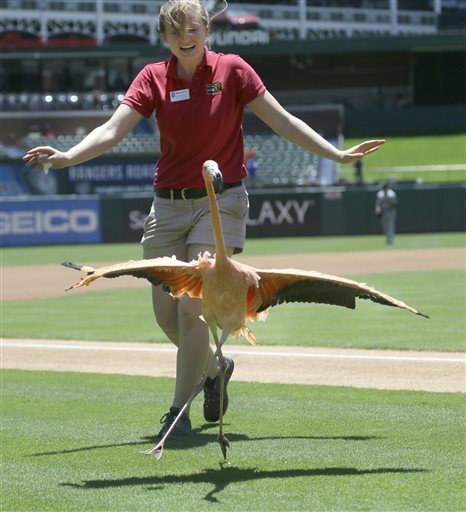 You'd almost think the woman is trying to mimic the bird's movements. Friday's loss, so illustrative of the flaws in the 2015 Twins, dropped their record to 42-38. That adds up to 80, so Ervin Santana's steroid suspension is now fully served. There appears little appetite among the decision makers for the six-man rotation, and I agree, in large part because at least two of the five rely on their two-seam fastballs (aka sinker) and, theoretically at least, such pitchers tend to do poorly on long rest. A trade may well be the ultimate answer, especially if Ricky Nolasco's ankle ever shows sign of improvement, but I'll be surprised if that happens promptly. Which would leave the bullpen shift option, Regular readers can probably guess that I regard Pelfrey as the logical choice to move. It's not going to be Hughes or Gibson; Milone, as a soft-tossing lefty, is a poor fit for a relief role; May, despite the worst actual ERA of the five, has the best FIP (Fielding Independent Pitching) of the group. Pelfrey starts today. We'll see if there are more starts in his future. I hope not, at least with the Twins. By coincidence, Sano Day -- the debut of Miguel Sano -- happened to be the opening of this year's international free-agent signings. The Twins, as was widely expected, announced an agreement with 16-year-old Dominican shortstop Wander Javier. Four million dollars breaks Sano's team record for an international signing. It also exceeds the Twins international bonus pool allotment, and I would expect the club to trade for some pool money from an organization less involved in the chase for Dominican talent. As for Javier: He's 16 years old, and nobody really knows what he's going to grow into. The Twins hope and expect he'll stick at shortstop and develop into a threat at the plate as well. But it's a long road for him and all the Dominican hopefuls. It was six years ago that the Twins signed Sano and Jorge Polanco and Max Kepler as well. It was quite an international haul, and Bill Smith, whose reign as general manager has drawn no shortage of criticism, deserves credit for pushing into the Dominican morass. But as well as those three have performed in the minors, none have yet established themselves on the major league level. That's coming, to be sure, but it illustrates the necessary timeline. The St. Louis Cardinals confirmed Thursday that they have fired their scouting director, Chris Correa, apparently because he was involved in the hacking of the Houston Astros database. Scouting director is, emphatically, not a low-level position. If Correa gained insights from his intrusion into the database about Houston's evaluation of specific players and-or their method of combining traditional scouting with statistical information, it has to be assumed that those insights were part of the conversation with other ranking St. Louis front office types, regardless of whether they knew of the hacking. That the hack reached that level in the hierarchy makes it impossible for commissioner Rob Manfred to go lightly on the organization when it comes time to impose penalties. A more traditional form of front-office shakeup happened this week in Anaheim, where general manager Jerry DiPoto concluded that there wasn't room for him and manager Mike Scoscia. Owner Arte Moreno backed Scoscia, and DiPoto left. There will be more defections from the Angels organization. That one of the reputed flashpoints between DiPoto and Scoscia was the use of analytics probably isn't going to help Moreno attract a new GM strong in the new wave of thinking. during a spring training infield drill. 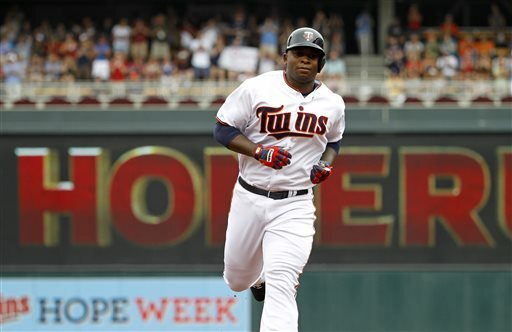 The Twins after Thursday's no-offense loss shipped Kennys Vargas all the way back to Double A. 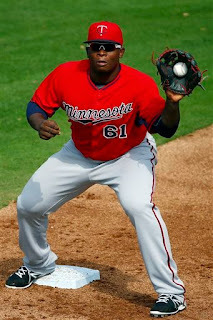 And the recall was of Miguel Sano, power prospect extraordinaire. Byron Buxton is generally rated a better prospect than Sano because his tool set is more varied. Sano, listed as 6-4, 260 pounds, isn't a burner, his ultimate defensive position is uncertain and it's possible he won't hit for average (but he might). But he has power like nobody the Twins have had since Harmon Killebrew, and that's a very valuable piece. As with the now-sidelined Buxton, this was supposed to have happened last year. But Sano injured his elbow late in the 2013 season. The decision was made, in consultation with medical experts, to try rest-and-rehab during the offseason, And very early in spring training, Sano made an offbalance throw, the ligament gave out, and he had Tommy John surgery and missed the entire season. The rusty Sano hit .159/.303/.381 in 18 April games for Double-A Chattanooga, striking out 22 times in 63 at-bats. The day Terry Ryan went to Chattanooga, Sano got three hits. His slash line for May: .303/.374/.556, with 26 strikeouts in 93 at-bats. In June: .329/.432/.658. Yeah, I think he can move up. Sano is 22, and his purported position is third base. But very few 260-pounders survive long there, and Sano's defense is still said to be uneven. Plus Trevor Plouffe has become a good glove man at the hot corner -- something I didn't foresee as recently as early last season -- and is one of the few fixtures in the lineup. So Sano figures to be the designated hitter. This is uncharacteristic of the Twins, who more than a decade ago kept David Ortiz in the minors to work on his first base defense rather than let him DH in the bigs. My joke at the time, repeated frequently, was that Ortiz didn't field well enough to DH. This move brings to mind the arrival in Baltimore of Eddie Murray, who had reached Triple A Rochester at age 20 (1976) and slugged .530 with 11 homers in 53 games there. That spring, Earl Weaver wanted Murray on his roster. The front office wanted to send him back to the minors to work on his defense. Weaver said: We'll work on his defense here. He can hit in the meantime. Murray played 160 games for Baltimore in 1977, mostly as the designated hitter. Veteran Lee May was the primary first baseman that year. The next season, the two sluggers changed roles. Murray wound up with 504 home runs, 3,255 hits, three Gold Gloves, the major league record for games played at first base and a Hall of Fame plaque. The DH season certainly didn't hurt Murray's development. era is about to begin. Ervin Santana wrapped up his prep work Tuesday with his third and final start for Triple A Rochester -- eight shutout innings. In 20.2 Triple A innings on this "rehab" assignment, the suspended steroidian compiled a 1.74 ERA. Santana is to start Sunday at Kansas City. Go to a six-man rotation. The latter two would require a different roster move, presumably involving one of the current relief pitchers. The Twins aren't tipping their hand on which way they're going. Paul Molitor is clearly cool to the six-man rotation idea, but he hasn't ruled it out either. We do know what the Twins are doing to fill the rotation hole Santana leaves at Triple A Rochester: They're promoting Jose Berrios from Double A Chattanooga. Berrios entered the season essentially neck-and-neck with Alex Meyer and Kohl Stewart in the organizational prospect rankings. His strong half season in the Southern League (3.08 ERA, 92 strikeouts in 90.2 innings) has established him as the top pitching prospect in the system. Berrios is to pitch, for the second year in a row, for the World team in the Futures Game. There was an item about him in the current issue of Baseball America, in which Doug Mientkiewicz -- who managed Berrios in the first half last year at High A Fort Myers and again this summer in Chattanooga -- said that last year Berrios was tipping his changeup. The Florida State League hitters couldn't do much with it anyway, but the tell had its effect on Berrios' numbers in the second half, when he moved up to New Britain and even, for one start, Rochester. This year, the tipoff is gone, according to Mientkiewicz via Baseball America. And Berrios' Double A strikeout rate has risen from 6.2 per nine innings last year to 9.1 this year.